One dish that is on weekly rotation over the summer months is pecan crusted tilapia. 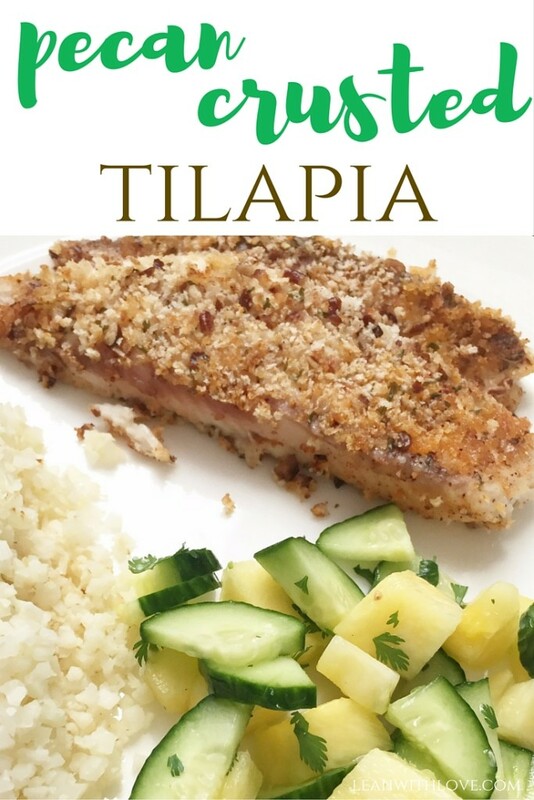 Tilapia is a go to fish for me, it’s easy to cook and can be done so many different ways. Kind of like chicken, with less cook time. When I make it, I love coating it with a crispy shell. The combination of the crunch on the outside with flaky fish on the inside is my preference. This entire meal can be made in under 30 minutes, which makes it a win in my mom book. 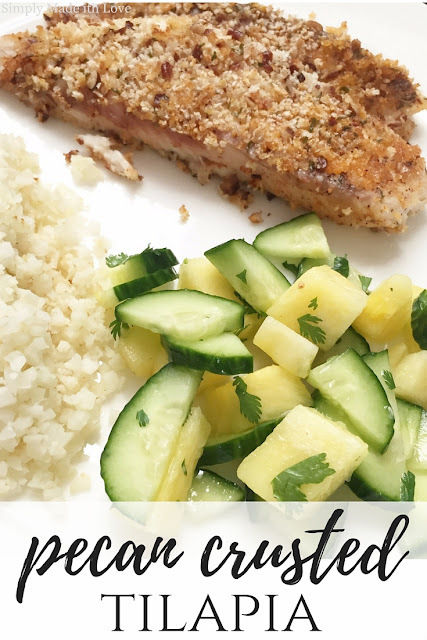 I served it with Trader Joe’s riced cauliflower and a pineapple cucumber salad. The entire meal is so fresh and healthy too. It just screams summertime! Do you have a go to dinner for the summer months? Place pecan pieces into a plastic bag. Place bag on top of a cutting board. Using a rolling pin (and a little muscle) coarsely chop the pecans. In a separate bowl, mix together pecans, panko crumbs, salt, pepper, paprika, parsley and garlic salt. Use 1-2 tsp of olive oil to coat fish. Then coat/ dredge fish with pecan panko mixture. After fish is coated with pecan mixture on both sides, place fish on a greased baking sheet. Bake at 400 for 20-25 minutes or until fish is white and flakes easily with a fork.